The house has an open floor plan with a stylish kitchen and living area. *1 master bedroom with a queen size bed, wardrobe and bathroom. *1 bedroom with a queen size bed and closet. *1 bedroom is equipped with a bunk bed and wardrobe. In total there are two bathrooms one of which is in the master bedroom. The kitchen is equipped with all the necessary appliances and utensils needed during the holidays to cook simple meals. The living room is equipped with a sofa, TV with inbuilt DVD player and a stereo with great sound. Bar that separates the kitchen and living area. On the outside there is a large terrace along the long side which then merges with the front. The terrace is equipped with garden furnitures: 4 sun chairs and 4 chairs and 1 table . Ceiling fan on the front side as well as a variety of lighting options. Lawn area where you can play badminton and a little ball. The back has a nice view towards the mountains and rain forest and the front side is facing a dam that makes the distance to the houses below! Also a nice driveway where you can park a car or scooter under the roof. Ceiling fans are obviously in all parts of the house and air conditions except for the bedroom with bunk beds where only a floor fan is available. We built this house from the ground with our own ideas and details! 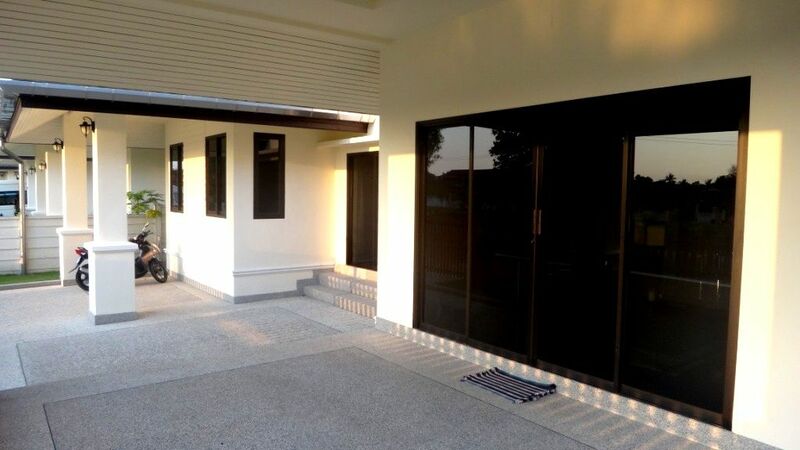 In order to have a nice holiday home but at the same time to be able to rent it out to well-behaved tenants during the times we aren't in Khao Lak! We believe in the area and Khao Lak entirely that has developed for each year in the direction according to our taste. Great variety of locals as well as restaurants and nature. Wonderful beaches and swimming! The area over all makes it very attractive to stay here and if you are going to live here then why not in a generous holiday house with an eye for style and function. Lovely property, well maintained,with everything you need to enjoy your stay. 2 markets within walking distance, plenty of small restaurants nearby. Awesome beaches to be discovered. Alexander's response time very good , and when a problem occurred, it was solved quickly. Nice to hear you had a great time and was satisfied with our house and response! We are a family with two teenage kids and stayed at this property for a week. It was truly a home away from home. Everything was as advertised. The kitchen is well equipped and there is a gas stove with two nifty burners, which make cooking a good experience. This is a convenient feature because 10 minutes away from the property, there is an open market with fresh fruits, vegetables, and seafood (prawns, fish, etc.). We cooked delicious meals in the wok provided, before leaving to visit places near Khaolak and Phang-Nga. Beds are comfortable and decorations around the house are welcoming and stylish. The surrounding area is quiet and beautiful (I used to run there in am). Street dogs are no problem, some are really friendly. Overall, this was a great experience and I highly recommend the property to other travelers. We had a great time. All what you need is in there and the Quality is more than "good". I really love the Kitchen and the Shower outside ! My daughter was everyday Houres on houres in the garden to looking for animals. And the Owner is very frendly and help where he can. I'm glad all of you had a great time! Vid uppenbart slöseri med el, genom att AC inte stängs av när ingen vistas i huset eller att dörrar och fönster står öppna utgår en avgift för förbrukad el! Elmätare läses av innan och efter varje ny hyresgäst använt bostaden. At obvious waste of electricity by the AC was not turned off when no one is in the house or that doors and windows are open, a fee of electricity used!